Over the last decade there has been an intense and widespread interest in the writing and publishing of cookery books; yet there remains surprisingly little contextualized analysis of the recipe as a generic form. This essay collection asserts that the recipe in all its cultural and textual contexts - from the quintessential embodiment of lifestyle choices to the reflection of artistic aspiration - is a complex, distinct and important form of cultural expression. In this volume, contributors address questions raised by the recipe, its context, its cultural moment and mode of expression. Examples are drawn from such diverse areas as: nineteenth and twentieth-century private publications, official government documents, campaigning literature, magazines, and fictions as well as cookery writers themselves, cookbooks and TV cookery. In subjecting the recipe to close critical analysis, The Recipe Reader serves to move the study of this cultural form forward. It will interest scholars of literature, popular culture, social history and women's studies as well as food historians and professional food writers. 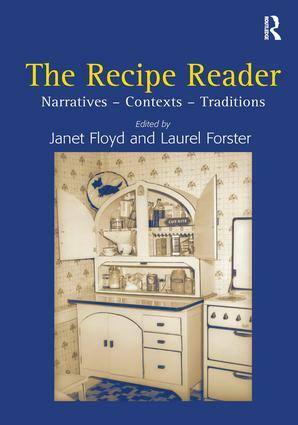 Written in an accessible style, this collection of essays expands the range of writers under consideration, and brings new perspectives, contexts and arguments into the existing field of debate about cookery writing. Contents: The recipe in its cultural contexts, Janet Floyd and Laurel Forster; Traditions: Of recipe books and reading in the 19th century: Mrs Beeton and her cultural consequences, Margaret Beetham; Redefining 'rudimentary' narrative: women's 19th-century manuscript cookbooks, Andrea K. Newlyn; 'Talking' recipes: What Mrs Fisher Knows and the African-American cookbook tradition, Andrew Warnes; Domesticating imperialism: curry and cookbooks in Victorian England, Susan Zlotnick; 'In close touch with her government': women and the domestic science movement in World War I propaganda, Celia M. Kingsbury; Individual Interventions: The importance of being greedy: connoisseurship and domesticity in the writings of Elizabeth Robins Pennell, Talia Schaffer; Simple, honest food: Elizabeth David and the construction of nation in cookery writing, Janet Floyd; Contemporary contexts: Liberating the recipe: a study of the relationship between food and feminism in the early 1970s, Laurel Forster; Regulation and creativity: the use of recipes in contemporary fiction, Sarah Sceats; Nigella bites the Naked Chef: the sexual and the sensual in television cookery programmes, Maggie Andrews; Adapting and adopting: the migrating recipe, Marina de Camargo Heck; Bibliography; Indexes.